Ally Scraps: September Design Team Reveal! Oh, and you could use other things in your layout (Your secret ingredients!) It was a blast making these layouts, and here is what we came up with. 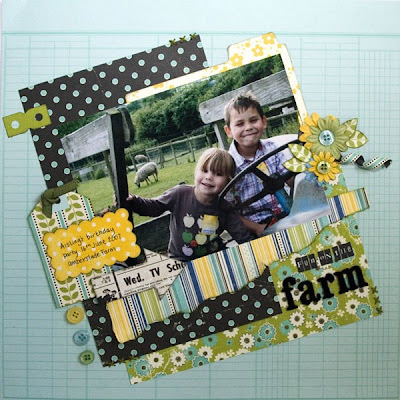 Morag used October Afternoon's yummy Hometown collection of papers and embellies. I love the fun slant to her layout and her layering in always so gorgeous. It is cool the way she used her buttons, I like that she used them two different ways. And, do you see that awesome curly paper, we have to ask Morag how to do that! Beautiful layout Morag... so pretty! I love the dimension on Trish's layout. So full of pretty 3D embellies and lots of paper layering. I love the sparkle here and there too. 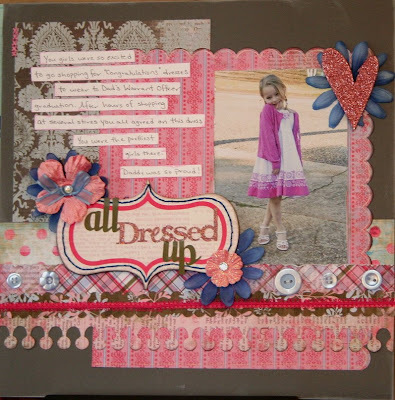 Trish used Pink Paislee's brand new Pop Fashion line of papers for her project, what an awesome layout Trish, thanks for sharing. Debbie's used Scenic Route's gorgeous Sonoma Line for her layout this month. Did you notice how she used the scrap strip paper to cut a big circle including many of the strips? I never thought to use it that way (but I will now! ), how clever! She also used American Crafts thickers for her title, love those! Debbie's flowers are so cute and love the row of buttons at the top too... super job Debbie! As usual Kary's layout is a lesson is dimension! Such gorgeous handmade flowers, distressed paper and unique title! 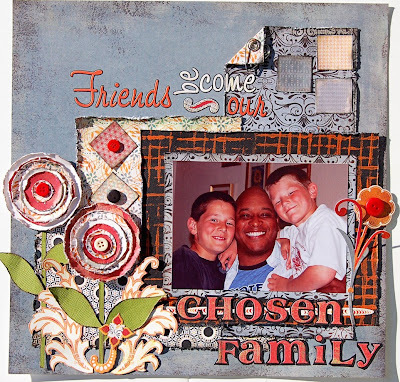 Love the way she put flowers on a BOY layout, beautiful job Kary! And, here is my layout. As usual I was a big cheater pants, beacuse I thought the last item in the recipe was brads and not buttons... so lots of brads for me. 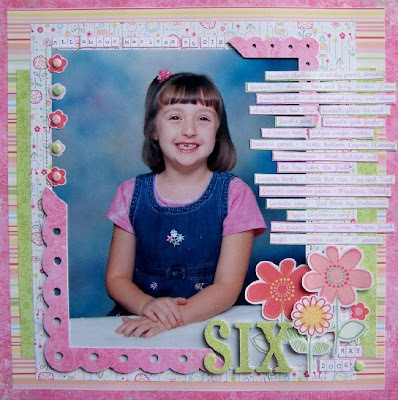 I just loved using these Sandlion girl collection papers for this layout about Marissa at age 6! The papers are SO soft and pretty, perfect for any girlie page. I did lots of journaling on this page, all about what were Marissa's favorite things at age 6. And, I used these adorable Sandylion flowers for my embellishments. I stuck them down on cardstock, cut them out and then used pop dots to give them dimension. Well, hope you will try our RECIPE for a layout of your own. Have fun with it and thanks for taking a look! fantastic layouts ladies! Each one of them is gorgeous! The layouts are wonderful. Love the recipe challenge theme.